Popup in WPF is a Windows that appears on top of a UI and shows a message. These code examples demonstrate how to show a popup in WPF using XAML and C#. A XAML Popup represents a popup window. 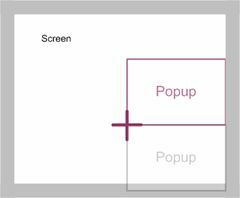 A popup window is a window that floats over a page or window providing functionality for some quick action, for example a login control on a page or to provide an animated popup tip. Fortunately, WPF comes with a Popup control to provide this functionality. This tutorial shows you how to use a Popup in WPF using XAML and C#. The Popup element represents a WPF Popup control in XAML. 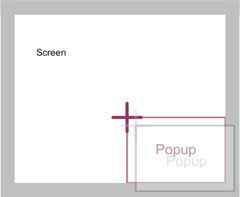 The Width and Height properties represent the width and the height of a Popup. The Name property represents the name of the control, which is a unique identifier of a control. 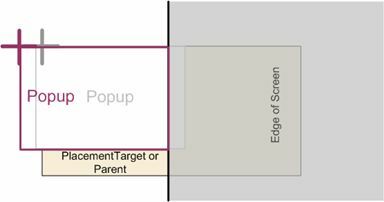 The Margin property tells the location of a Popup on the parent control. The HorizontalAlignment and VerticalAlignment properties are used to set horizontal and vertical alignments. The following code snippet sets the name, height and width of a Popup control. The code also sets the horizontal alignment to left and the vertical alignment to top. 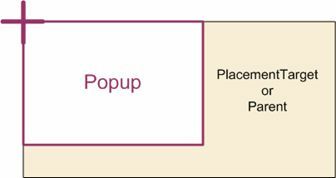 To make a popup control visible, you need to set the IsOpen property to true. A Popup control can have only one child. The following code snippet adds a text block to the popup control. If you wish to add more content to the popup control, you may have a stack panel or grid as a child control and place more content on the panel or grid controls. The following code snippet creates a stack panel and places some content on it. The popup created using the preceding code looks as in Figure 1. Once you have a popup content defined, you can do anything with this content depending on the controls. For instance, if you are using an image as content, you can do anything with the popup that you can do with the image. 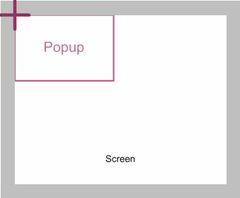 The following code shows how to animate a popup window. 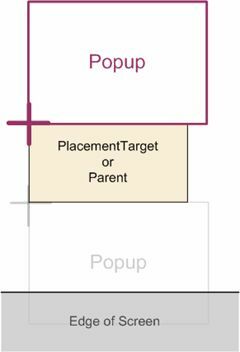 The Placement property of Popup describes the placement of where a Popup control appears on the screen. If you do not set any positioning or placement of a popup, the popup will appear in the left top corner of the window. The PlacementMode enumeration represents the Placement property. The following code snippet sets the Placement property to AbsolutePoint. 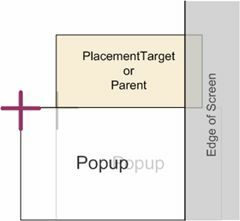 The following illustrations and definitions from the MSDN show how the PlacementMode enumeration values help you place the Popup window and adjust its position when screen boundaries obscure its content. A Popup control is positioned relative to the upper-left corner of the screen and offset by the HorizontalOffset and VerticalOffset properties. If a screen edge hides all or part of the Popup, the control realigns with the obscuring edge. 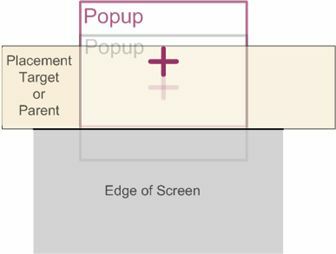 If a screen edge hides all or part of the Popup, the control opens in the opposite direction by starting at the point that is defined by the offset properties. 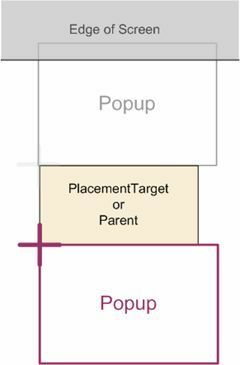 A Popup control is positioned where the control aligns its upper edge with the lower edge of the PlacementTarget and aligns its left edge with the left edge of the PlacementTarget. If the lower edge of the screen hides all or part of the Popup, the control realigns with the upper edge of the PlacementTarget. If the upper edge of the screen hides all or part of this new position, the control realigns with the lower edge of the screen. After these adjustments, if the control is still partially hidden by the upper edge of the screen, the control realigns with the upper edge of the screen. If a vertical screen edge hides all or part of the Popup, the control realigns with the obscuring screen edge. 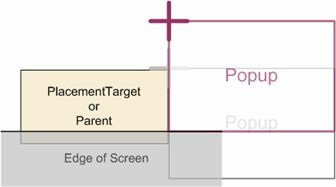 A position of the Popup control where the control centers itself over the PlacementTarget. If a screen edge hides all or part of the Popup, the control realigns with the obscuring screen edge. 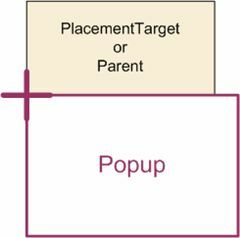 A Popup control that aligns its right edge with the left edge of the PlacementTarget and its upper edge with the upper edge of the PlacementTarget. 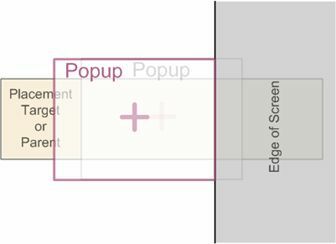 If a horizontal screen edge hides all or part of the Popup, the control realigns with the obscuring screen edge. 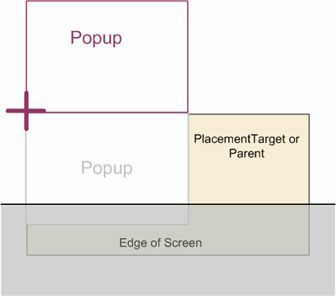 If a vertical screen edge hides all or part of the Popup, the control realigns on the opposite side of the PlacementTarget. 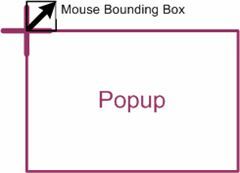 A Popup control is positioned where it aligns its upper edge with the lower edge of the bounding box of the mouse and it aligns its left edge with the left edge of the mouse bounding box. 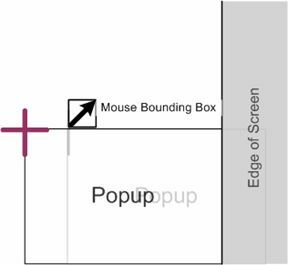 If a horizontal screen edge hides all or part of the Popup, the control displays on the opposite side of the mouse bounding box. 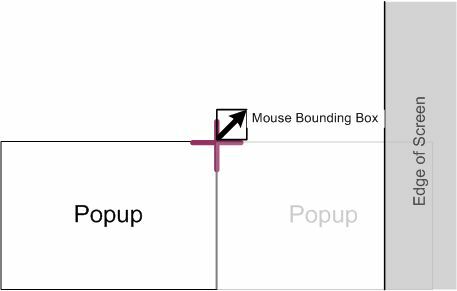 A position of the Popup control that aligns its upper edge with the lower edge of the mouse bounding box and its left edge with the left edge of the mouse bounding box. 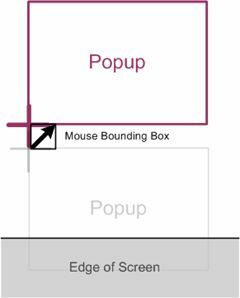 If a screen edge hides all or part of the Popup, the control realigns on the opposite side of the mouse bounding box. A position of the Popup control that is relative to the upper-left corner of the PlacementTarget and at an offset that is defined by the HorizontalOffset and VerticalOffset property values. 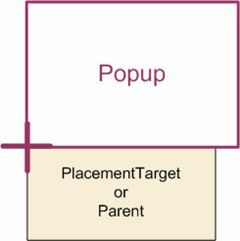 A position of the Popup control that aligns its left edge with the right edge of the PlacementTarget and aligns its upper edge with the upper edge of the PlacementTarget. 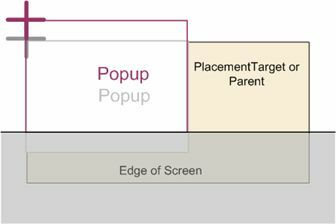 If a vertical screen edge hides all or part of the Popup, the control displays on the opposite side of the PlacementTarget. If the upper or lower screen edge hides all or part of the Popup, the control realigns with the obscuring screen edge. 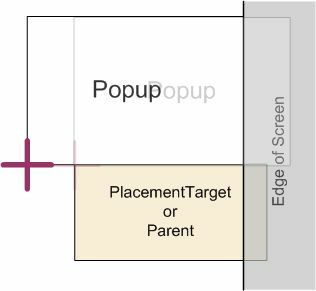 A position of the Popup control that aligns its lower edge with the upper edge of the PlacementTarget and aligns its left edge with the left edge of the PlacementTarget. If the upper edge of the screen hides all or part of the Popup, the control displays below the PlacementTarget. If the lower edge of the screen hides the Popup in the new position, the control realigns with the lower edge of the screen. If the control is still obscured by the upper screen edge in the third position, the control realigns with the upper screen edge. 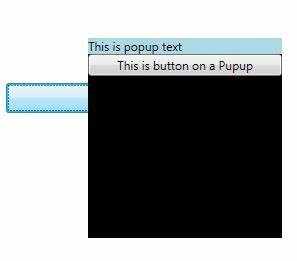 In this article, I discussed how to use a Popup control available in WPF. 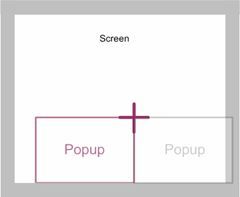 The article also shows how to animate a popup.